Set sail on an epic voyage to the ends of the Earth with the Azamara Pursuit! Launched in 2018, the Azamara Pursuit was the latest ship to join the Azamara fleet. Having recently undergone extensive refurbishment and modernization, she now sails exotic itineraries to every continent on Earth – even Antarctica. Azamara Club Cruises specializes in high-end, destination-intensive cruising. The small size of its ships make them great for exploring little-known ports, as well as getting to know your fellow cruise passengers. With a passenger capacity of just 750, meeting people on your journey is sure to be a breeze, and after the first day, you can expect your waiter will remember your name. 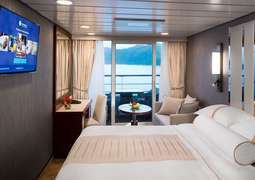 Azamara cruises are popular among older adults looking for a relaxing vacation, couples looking for a quiet getaway, and sophisticated travelers looking for a stress-free way to see the world and learn about its many cultures. With long port stays and shore excursions focused on cultural authenticity, you'll have the chance to truly experience the destination you travel to and will feel less like a visitor and more like a welcomed guest. 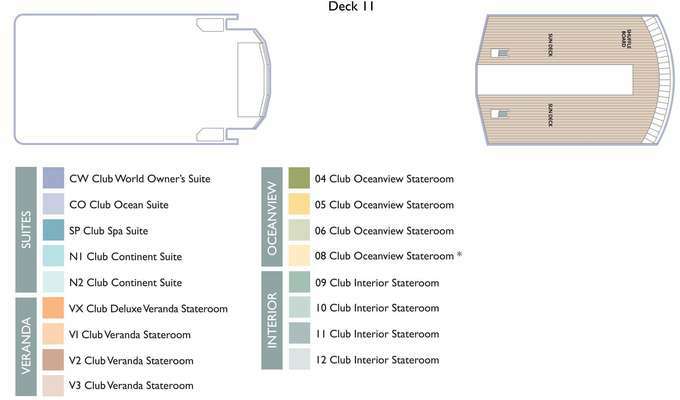 Stateroom size : 158 sq. 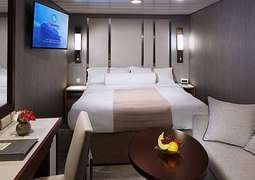 ft.
Refurbished in 2018, the staterooms on the Azamara Pursuit reflect the highest standards in modern amenities and elegant design. 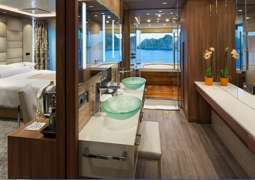 The staterooms are outfitted in calming beige and white, with tasteful gold accents and teak furniture to provide a touch of style. Little touches like a bowl of fruit, fresh flowers and a well-stocked refrigerator will make you feel right at home, and room service is available 24/7. Upgrade to a veranda stateroom or a suite to soak up the sun on your own private balcony, and enjoy the services of a private butler and a complimentary internet package during your stay. Seven different restaurants, lounges and cafes serving mouth-watering meals provide not just a variety of choice in dining, but also the perfect spaces to relax. Turn dinner into an evening-long affair and enjoy course after course of delicious delicacies in the main dining room. Lounge at the popular Mosaic café and use the chance to chat with fellow passengers, or watch the waves go by at the Windows Café. The public spaces are inviting for snacking, socializing and relaxing. With a new ship comes a new entertainment program. The Azamara Pursuit is proud to present Feinstein's/54 Below, inspired by the legendary New York cabaret. The entertainment program ranges from solo singers to opera performances to comedic and sentimental theater shorts. 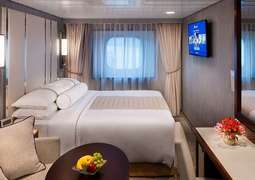 The popular White Night parties, featured once per cruise on most itineraries, are an open-air deck party and buffet, and cruise passengers can mingle with the crew. Perhaps the most exciting event, the "AzAmazing" events are an evening shore excursion/entertainment program that give passengers a chance to experience the culture of the destination they're in. Azamara Club Cruises calls for a resort casual dress code. Passengers typically change into long pants and collared shirts in the evenings, and semi-formal or formal wear is encouraged for the main dining room and specialty restaurants. There are no formal nights.